The composition of the starter culture depends on the intentions of the cheese maker. If the cheese-making procedure includes a step where the curds will be exposed to high temperatures, such as during manufacture of Swiss, Parmesan, and Mozzarella cheese, then a thermophilic lactic acid bacterial culture able to withstand those temperature must be used. If a particular flavor compound is desired, such as diacetyl in Gouda cheese, then again, the culture must contain specific organisms capable of producing those flavor compounds. In fact, culture technology has advanced now to the point where each strain present in the cul ture can be selected on the basis of the specific performance attributes desired by the customer. Thus, the culture can contribute to considerable variation in the finished cheese, and even modest changes in the culture composition or amount can result in dramatic differences in the cheese. (i.e., when fermentation is expected to occur). The mesophilic cultures are the workhorses of the cheese industry, and are used for the majority of cheeses. Thermophilic cultures, mainly Lactobacillus helveticus and Streptococcus thermophilus, are also widely used. They have a temperature optima around 42°C to 45°C and are able to grow at temperatures as high as 52°C. Like the mesophiles, however, temperatures just a few degrees higher than their maximum growth temperature may result in thermal inactivation. This means that when curds are heated, the temperature must not exceed that which the culture can tolerate. Otherwise, the culture will be inactivated or injured and the subsequent fermentation will either be slow or not occur. However, it should be noted that thermal effects on microorganisms obey first-order kinetics, such that inactivation or killing occurs at a logarithmic rate.Thus, even when the temperature reaches a lethal level, some cells will survive (depending on the exposure time) and be able to grow (albeit slowly), once a compatible temperature is established. Most of the strains that comprise mesophilic and thermophilic cultures are homofermenta-tive. However, heterofermentative lactic acid bacteria may be included in mesophilic cultures that are used for particular cheeses. Specific heterofermentative species include Leu-conostoc mesenteroides subsp. cremoris and Leuconostoc lactis. Not coincidently, these organisms also ferment citrate and produce di-acetyl.Thus, cheeses such as Gouda and Edam have a buttery aroma, as well as a few small eyes, due to CO2 formation. Finally, cultures may also contain non-lactic acid bacteria for Swiss-type and surface-ripened cheeses, as well as fungal spores for mold-ripened cheeses, as will be discussed later. Until relatively recently, bulk cultures grown in whey or milk without pH control were the dominant form in which cultures were used (reviewed in Chapter 3). Culture inoculum for Cheddar type cheeses was usually about 1% (w/w), which gave an initial cell concentration of about 5 x 106 cells per ml of milk. Other cheeses are made using more culture (e.g., Mozzarella is normally made with a 2% starter) or less culture (e.g., Swiss is made with 0.5% culture). Although these traditional bulk cultures are still used, in the past twenty years, bulk culture tanks began to be equipped with external pH control systems. This simple technology made it possible for operators to partially neutralize the medium as the cells grew, and, therefore, maintained the pH at a level that was more to the liking of the starter culture organisms. Specialized culture media was also introduced that provided "internal"pH control.With the widespread use of these pH controls, bulk culture systems, culture viability, and cell density (i.e.,cells per gram) have been significantly enhanced. Thus, less culture is necessary, perhaps half as much on a weight or volume basis. 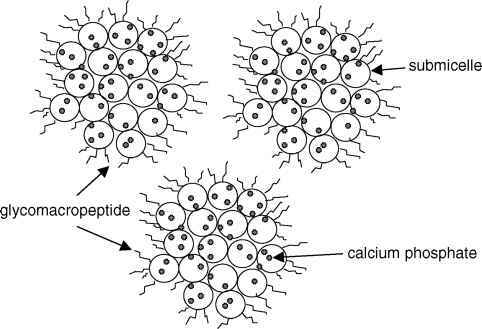 In addition, highly concentrated, direct-to-vat cultures are also now widely used.These products may contain ten or more times as many cells as traditional bulk cultures. One 500 ml can, for example, is sufficient to inoculate 10,000 L of milk (i.e., 0.005%). Despite the consistent nature of modern cultures, their activity and cell density may still be somewhat variable.Thus, it is important for cheese manufactures to adjust inoculum levels to satisfy production schedules and performance expectations. In the case of Cheddar cheese, if too much culture is added, acid development might occur too rapidly, resulting in early loss of calcium and demineralization of the cheese (discussed later). In addition, a large culture inoculum may lead to excessive production of proteolytic enzymes that can eventually affect cheese yield, flavor, and texture. In contrast, if not enough culture was added, fermentation and acid development is delayed, causing production schedule headaches as well as opportunities for spoilage or pathogenic organisms to grow. It is important to note that, despite the availability of defined and consistent starter cultures, there are some cheeses made using more traditional starter cultures. Parmigiano Reg-giano, the authentic version manufactured only in the Parma region of Italy, is made using whey as starter culture, a form of backslopping. Many of the Dutch-type cheeses (e.g., Gouda and Edam) are still made using undefined strains maintained simply as a mixed culture. Whether a pure, mixed, or undefined starter culture is used, the milk for most cheeses made with a mesophilic culture is ordinarily brought to a temperature between 30°C and 40°C (higher for cheeses made using thermophilic cultures). If early culture growth is to be encouraged, the milk may be held for a period of time within this temperature range. However, despite a mostly favorable temperature, little culture activity and little acid development normally occurs during this early stage of the process. This is because the cells either are coming out of a somewhat dormant phase (in the case of frozen or lyophilized direct-vat-set cultures), or are adapting from a rich, almost ideal bulk culture medium to a milk medium that requires induction of at least some new biochemical pathways, such as those involving protein hydrolysis and amino acid use. Depending on the culture media and culture preparation conditions, it is possible for cultures to be rather active, with relative short lag phases. In general, most cultures still experience a lag phase (that may be quite extended, especially if a cooking step is also included), before active log phase growth occurs. Although growth of the culture and production of fermentation end-products (other than lactic acid) usually does not occur until later in the cheese making process, delays due to culture inhibition can cause serious problems for the manufacturer. Large cheese factories that process a million or more Kg of milk per day require high throughput (i.e.,the rate that milk is converted to finished cheese products). A bottleneck at the fermentation step may place upstream operations are on hold, disrupting production schedules and perhaps causing employees to work extra hours. Of course, if the fermentation is slow, sluggish, or fails altogether, cheese quality will be poor. There are several possible causes of starter culture inhibition. Although state and federal laws require that milk be free of antibiotics, if residues were present they could inhibit the lactic culture. However, it is now very rare that milk would contain undetected antibiotics. Milk may also contain natural immunoglobulins that bind to culture bacteria, forming clumps that eventually settle in the vat.This is particularly a problem in Cottage cheese due to the long fermentation time. Another potential inhibitor is formed via the lactoperoxidase reaction.This reaction occurs when the enzyme lactoperoxi-dase oxidizes thiocyanate in the presence of hydrogen peroxide to form hypothiocyanate.This reactive compound can be inhibitory to certain starter culture lactic acid bacteria. Lactoperoxi-dase and thiocyanate are naturally present in milk, and hydrogen peroxide can be produced by the endogenous microflora. It is also possible to activate this reaction by inoculating raw milk with hydrogen peroxide-producing lactic acid bacteria in an effort to control psychrotrophic spoilage bacteria. Chemical agents used to sanitize cheese vats can occasionally inhibit cultures if residues are not adequately rinsed. By far, however, the main cause of culture inhibition are bacteriophages, viruses that infect bacteria—in this case, lactic acid bacteria (Chapter 3).Their detrimental role in the cheese making process, and the means by which phage problems can be controlled, will be discussed later in this chapter.